Bali waterfalls | Do go chasing these awesome waterfalls in Bali! Tegenungan waterfall is possibly the most visited Bali waterfall as it’s located only a 30-minute drive from Ubud. The steps to the waterfall are very friendly for the calves which makes them very accessible for most people. When you make it down the stairs you will see all kinds of stones nicely layed out which makes the place extra photogenic. As it is one of the busiest waterfalls on the island, your best chances to get the nicest pictures is before 8 am when all the tourist buses haven’t made their way to the waterfall yet. 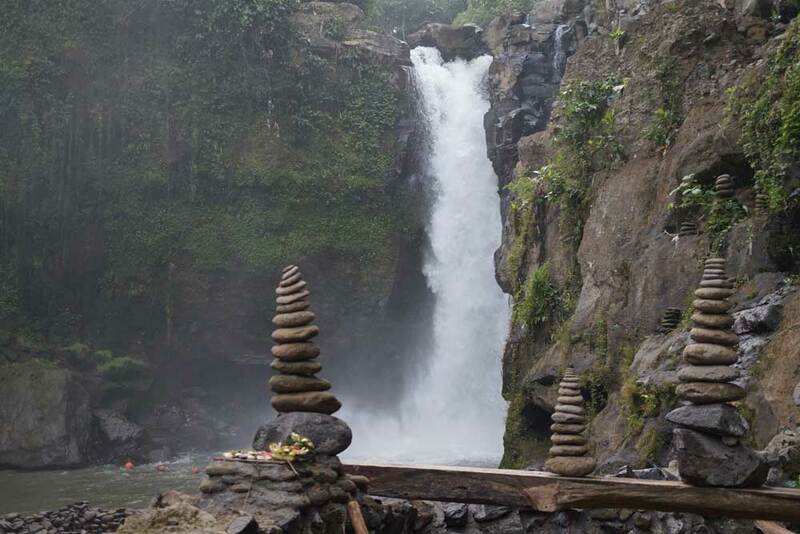 The Kuning waterfall is one of Bali’s best-kept secrets. Not many people know about this gem. Which is really cool as you can come to this spot and have the waterfall all to yourself. The hikes down and up are a bit steep but doable. Be sure to wear good shoes. The waterfall itself is amazing and perfect for swimming. Be careful though of the stream to the river which has lots of undertows. The restaurant at the top is a big bonus: good food, cheap and an awesome view over the rice paddies. As with many Bali waterfalls these days, also at the Kuning waterfalls you will find a swing which is at a price of 50.000 ruphia actually much cheaper than the swings you find in most other places. Turn on your GPS, follow it through, this spot is well marked and hard to miss. It’s a bit of a narrow trail towards the end so if you’re not confident on a scooter you can walk the last couple of hundred meters to the ‘setting off’ point where you’ll meet the smiling and helpful locals who seem genuinely pleased to meet you and grateful that you’ve come to visit their little corner of the world. From the setting off point it’s about 100-150 down. Although it’s steep, the steps to the waterfall are very manageable. The surroundings are lush and green, and there’s a wonderful feeling of peace and tranquility to the place. The water is chilly but are a treat after your hot hike downwards. All together the Jagasatru waterfall makes a great spot for photographs that will boost your Instagram feed! Good to know: there is no set entrance fee but the locals do ask for donations. 10-20,000 rupiah per person should be sufficient. You can pay more if you feel like contributing to the local community keeping the area clean and green. The Gitgit waterfall lies in the North of the island and makes a great visit when you stay in either Munduk, Lovina or when you’re just cruising the north for the day. You’ll reach the waterfall by walking down many (easy) steps through nature. From afar you can hear the water crashing down. Just as most other waterfalls and places, it’s recommended to go as early as possible to beat the crowed and the heat. The entrance fee for this Bali waterfall is around 20.000 ruphia per person. There are local stallholders along the pathway who will try to sell you their wares, but they are not pushy and do take “no thank you” for an answer. Pro tip: take an umbrella just in case of a downpour – a frequent occurrence in the mountains. In the lush north of the island there are many waterfalls. We absolutely love how people can jump of slide safely into the Aling-Aling waterfall. If you need a little help you can pay a local guide around 100.000 ruphia to show you around and lend you a hand navigating the waterfalls. The Sekumpul waterfall is a must-see experience. The hike is not too difficult, and the views of the falls are just awesome. We suggest bringing some water shoes, so you don’t have to walk barefoot across rocks and. Definitely, take time for a swim in the cold water. It’s very refreshing and absolutely worth your while. This last waterfall in the north is an easy but long trek downwards. Also here you’ll find a swing and you can jump right into the water. You can still say that Banyumala is unspoiled by the mass crowd. The entrance fee is just a small amount and worth every penny. Make sure you carry a bottle of drinking water with you. We are pretty sure you’ll need it. 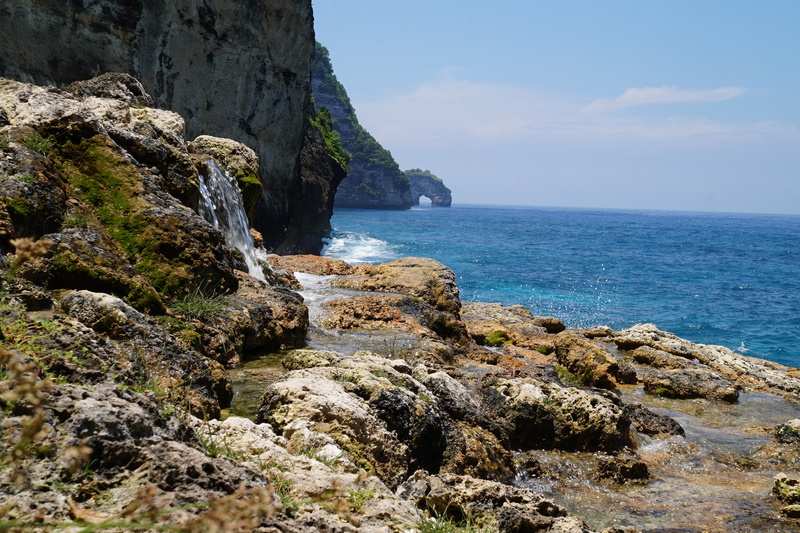 Neighboring island Nusa Penida also belongs to Bali. The island has been a hidden gem right up until about 2016. These days more and more tourists make their way to the unrugged island and there is a good reason for that. There are so many gorgeous sights to visit that you need at least a day or 4 to really soak in all the good stuff. One of the waterfalls you can visit is the Sedaning waterfall. It’s not one of the main attractions, so don’t expect hurdles of tourists. The reason that it remains a quiet spot is that it’s pretty steep to climb down (and back up) along a very challenging path. You wouldn’t necessarily rely on the bamboo fences that should prevent you from falling down if you were too. So yes, this waterfall is not for the faint of heart. Bring good shoes, drinking water and swimmers when you decide to visit the Sedaning waterfall. Note: The waterfall is actually more like a stream that comes down from the cliff. So don’t have too high expectations of the waterfall itself. You really go here for the scenery around the waterfall and the challenge to get there. Read our complete Nusa Penida guide. Done chasing waterfalls and worked up a good appetite? Our mystery dining tours are the way to go to explore culinary Bali in every aspect possible. Our food tours Bali vary from the best restaurants in Seminyak, the best restaurants in Jimbaran till some good old fashion Bali street food. The best thing of all is that we keep the exact location and dishes a big surprise till the very moment you are already on your merry way.